Wynne-Jones (the Zoom trilogy) creates some lovely, offhanded rapport between mother and son (“We are matching tigers,” says S.A.M. “Roar,” says K.)...[Won's] digital images, which combine the look of 1960s animation with a variety of compositional styles, handily capture both everyday sights (a shoe salesman carrying an improbable number of shoeboxes) and the drenched-in-shadows menace of imagined international intrigue. Text and art find their comedic stride when S.A.M. looks for K. in the Holding Cell of Despair (the toilet) and the Rocket Silo (broom closet)...Energetic compositions and appealing artwork bolster this spy-friendly text. The snappy language and playful atmosphere are very entertaining, especially when K plays along with S.A.M.’s game and when S.A.M.’s new tiger-striped shoes help him come to the rescue when K disappears after a boom of thunder (she’s outside collecting the laundry before a rainstorm). 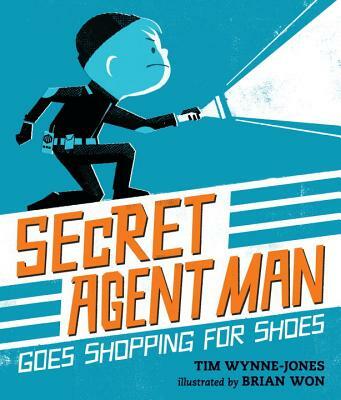 This spirited story captures the enthusiasm of make-believe games, not to mention the appeal of brand-new sneakers. The rather irksome task of shoe shopping gets the golden Bond touch here, as our young 007 takes both the tasks of finding new beaters and protecting the world with equal seriousness, resulting in an entertaining mix of satire and gentle humor...His Team of Expert Spies (three of his stuffed animals) and his code names for various locations in the house (the bathroom is the “Holding Cell of Despair,” while the piano bench is the “Torture Chamber”) are sure to elicit chuckles from viewers. Don’t be surprised if a few kids show up at the next storytime clad in black, flashlight in hand, and, of course, wearing some super-sweet sneakers. The realistic and the imaginary realms merge at climactic points, with the illustrations appearing either split screen–style or with a frightened Sam shown as a child against the dark S.A.M. background. Children will enjoy sharing Sam’s clever, creative adventure. A terrific read-aloud with bold, dynamic art. This is a silly story that discusses a topic young children can personally relate to...The story is easy to follow and the images are very bright and vivid, instantly drawing the reader’s attention.